﻿﻿Home of the great warrior William Wallace, as well as the fictional school Hogwarts of Harry Potter fame, Scotland intrigues with legend and myth, mystical landscapes, and enchanting castles. Visit present-day Highlander villages, and follow park rangers through the glens and gorges of three beautiful parks from Ben Nevis to Loch Ness. Paddle a canoe past prehistoric houses on Loch Tay and sail on Loch Ness, hearing tales about the legendary monster that is said to inhabit its depths. Board the steam train featured in the Harry Potter movies for a spectacular ride from Fort William to Mallaig. Explore three protected areas with park rangers, spotting birds, handfeeding red deer, and hiking through the stunning gorge at Glen Nevis. Cruise past a medieval castle on the shores of mystical Loch Ness and kayak with seals in Arisaig Bay. Welcome to Scotland! Arrive in Edinburgh after an overnight flight and travel as a group to the town of Pitlochry, on the edge of the Scottish Highlands. Discover Scotland’s wild side on a visit to the Wild Space visitor centre, run by the John Muir Trust, an organization dedicated to preserving Scotland’s natural treasures. Get to know Scotland’s flora and fauna and find out what’s being done to protect them. Learn about the John Muir Award, which families will attempt to earn through a variety of activities during our trip. Check into our castle hotel this afternoon and meet up for a fun welcome dinner. Our first John Muir Award activity brings us to Loch of the Lowes, a pristine lake that harbors a wide variety of woodland creatures and aquatic life. A ranger from the Scottish Wildlife Trust joins us here for hands-on conservation activities, as well as walks through the forest and along the shore. This afternoon, meet our pen pals and their families back in Pitlochry for a fun afternoon of Highland games, including a haggis toss, a welly (gum boot) hurl, tug-o-war, and races. Try a few steps of Scottish dancing and learn to blow a tune on a bagpipe. Travel west to Loch Tay, a long, narrow lake that counts among the largest in Scotland. Hop into a canoe to explore the loch’s sloping shores and its crannogs and islands. Then head to the award-winning Scottish Crannog Centre to learn more about life in the Highlands some 2,500 years ago, and try your hand at millennia-old woodworking techniques. After lunch, pay a visit to Blair Castle, and hear stories of dukes, ladies, queens, and butlers on a castle tour. Later, a storyteller joins us back at our hotel to recount intriguing tales of Scottish history and mythology. Adults can opt to tour a local whisky distillery. As we make our way to Fort William today, stop in Newtonmore for a visit to the acclaimed Highland Folk Museum— a living history museum and Green Tourism award winner. Here, we’ll dig deeper into the ancient culture of the Highlands. Continue to Fort William, nestled below Ben Nevis, the highest mountain in the United Kingdom. If you wish, set off on foot along the Caledonian Canal. Board the Hogwarts Express steam train this morning! The train, actually named the Jacobite, was featured in the Harry Potter films and is part of the West Coast Railways system. Its historic route, celebrated as one of the most spectacular in the world, brings us past lakes and over an age-old viaduct on the way from Fort William to Mallaig. Enjoy lunch in the village of Arisaig, where views of the sea can include some of the isles of the Inner Hebrides. This afternoon, go kayaking with seals in Arisaig Bay or head to nearby Glenfinnan to trace the dramatic events of Bonnie Prince Charlie’s Jacobite rebellion. Set out on a morning hike from Glen Nevis to Steall Falls, passing through a beautiful gorge. Meet with a John Muir Trust ranger to participate in restoring and maintaining the parklands of Ben Nevis Estate. 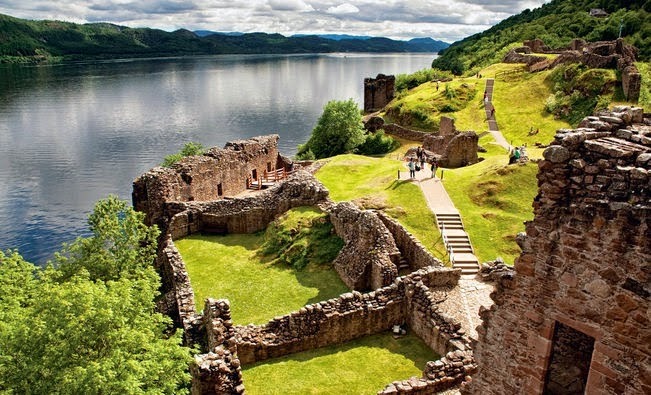 Then follow the shores of the famous Loch Ness north to Inverness, considered the capital of the Scottish Highlands. Glide across stunning Loch Ness on a morning cruise and delve into the lore surrounding its mysterious monster. Pass the ruins of Urquhart Castle, a medieval fortress that saw many a battle in Scotland’s long conflict with England. After lunch in Cairngorms National Park, meet with a park ranger for our final John Muir Award activity, learning the importance of the red deer population in the park. Encounter some of these creatures, the largest wild land mammals in the United Kingdom, and with our ranger’s guidance, feed them by hand. Back in Inverness tonight, celebrate our Scottish adventure—and our conservation work—at a farewell dinner. Drive back to Edinburgh this morning, stopping at sites along the way. Transfer to the airport for your flight home or extend your stay in Scotland. Prices are per person, double occupancy. For a single room, add $500. International airfare to/from Edinburgh is not included in the expedition cost. On this trip, young explorers will have an opportunity to earn the John Muir Award. Established to inspire kids to care about the natural world, the award is comprised of four challenges in the areas of discovery, exploration, conservation, and storytelling. Our dynamic Expedition Leaders enrich each experience with their insights, knowledge, and energy, and a Young Explorer Leader joins every group to facilitate fun activities that help kids get the most out of the places we go. As we travel, we’ll also meet up with fascinating people doing meaningful work in the field.